1867年上海寄日本长崎实寄封1件，贴上海工部第二版小龙1分银3分银各一枚，1分银销红色上海工部信馆中英文戳，有上海67年4月16日蓝色日戳，内部写满书信内容，保存完好，为目前所知上海工部小龙邮票最早使用完整邮件，周炜良先生旧藏，十分罕见。 China Municipal Posts Postal History 1967 (19 Apr.) 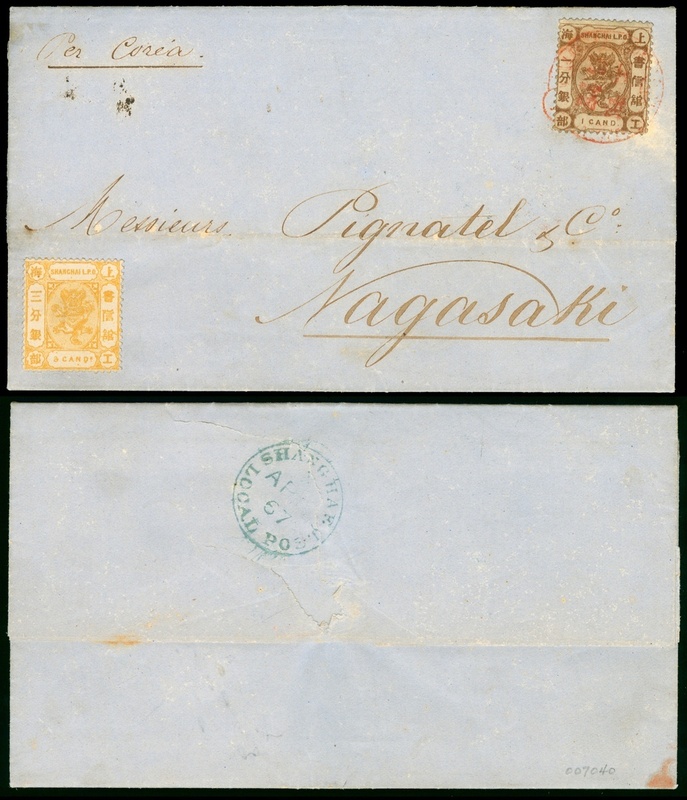 blue entire letter to Nagasaki “Pre Corea” bearing 1867 1ca. brown tied by small garter cancellation in red and 3ca. olive-yellow (uncancelled), the flap bearing a good strike of “SHANGHAI/LOCAL POST” dispatch c.d.s., which opens out well for display, This is believed to be the earliest external use of Shanghai local post stamps on cover and is generally accepted as one of the most famous covers of Shanghai. PROVENANCE : Wei-Liang Chow, February 1997.